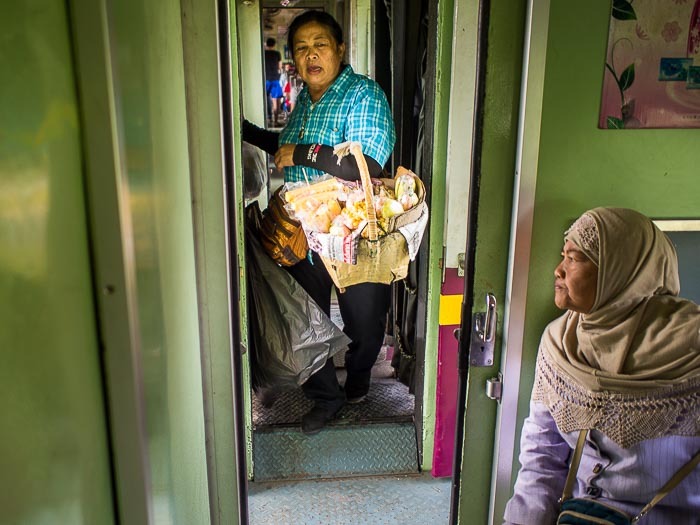 A snack vendor walks the aisle in a third class train running from Ayutthaya to Bangkok. The Ayutthaya line of State Railways of Thailand was built in the late 1800s and was the first train line in Thailand. Thailand has a vast train system that crisscrosses the Kingdom. You can travel from the Malaysian border all the way to Chiang Mai in northern Thailand or Nong Khai, on the Lao border in Isaan. If you want to be a stickler, you can start in Singapore and ride the rails all the way to Vientiane, Laos, with transfers in Kuala Lumpur and Bangkok. It would take several days but it could be done. 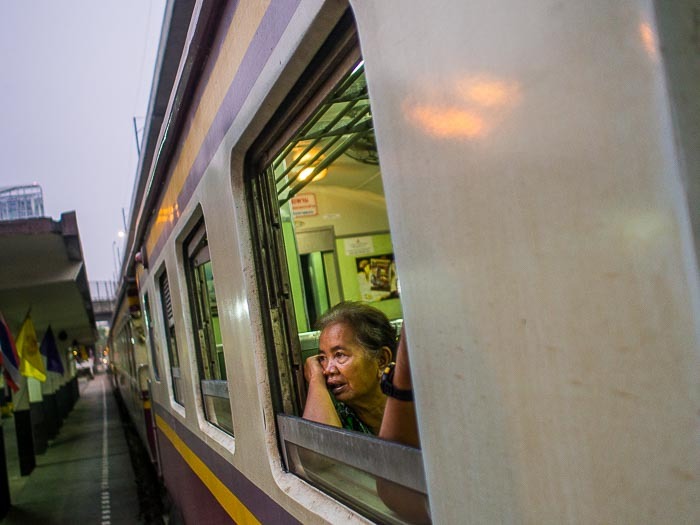 On the line to Aranyaprathet, a town on the Cambodian border, a woman looks out the window of a train leaving Bangkok. 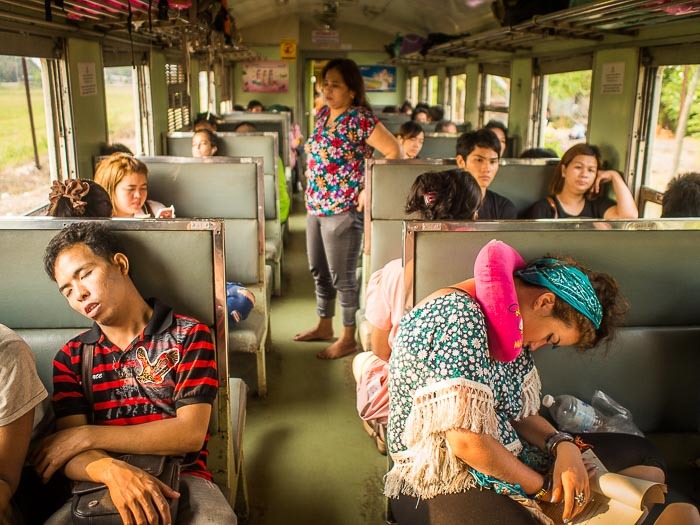 Thailand's trains provide a reasonably reliable and very inexpensive way for people to travel across the Kingdom. Third class fares on most trains are just a couple of dollars. The two hour trip to Ayutthaya is only .60¢ (20 Thai Baht), the four hour run to Kabin Buri, near the Cambodian border, is just over $1.00 (33 Thai Baht). The third class train to Chiang Mai, a bone crunching 15 hours in an unairconditioned car, is only about $4.00 (121 Baht). To give an idea of how inexpensive third class train travel is in Thailand consider this. My tickets to and from Kabin Buri were just over $2.00 (66 Thai Baht round trip), my lunch in Kabin Buri was 30 Baht (under $1.00) for curry and rice with a bottle of water, throw in a couple of bottles of water at 10 Baht each (.30¢) and the total was about 116 Baht. Taxi fare for the 30 minute ride from our apartment to Hua Lamphong train station, to catch the early morning train, was 120 Baht (about $4.00). Note that I am not complaining about the cab fare. Bangkok taxis are very inexpensive compared to taxis almost anywhere else for a city of similar size. I call the service "reasonably reliable" because trains are almost always late. Sometimes just a few minutes but hours late is common. My train to Ayutthaya this week, supposed to be about an 80 minute ride, was over two hours. My train to Kabin Buri yesterday, scheduled to be 3:45, chugged into Kabin Buri station about 20 minutes late. The train to Kabin Buri. Maybe because there's so much opportunity, the world is looking at Thailand's trains with covetous eyes. 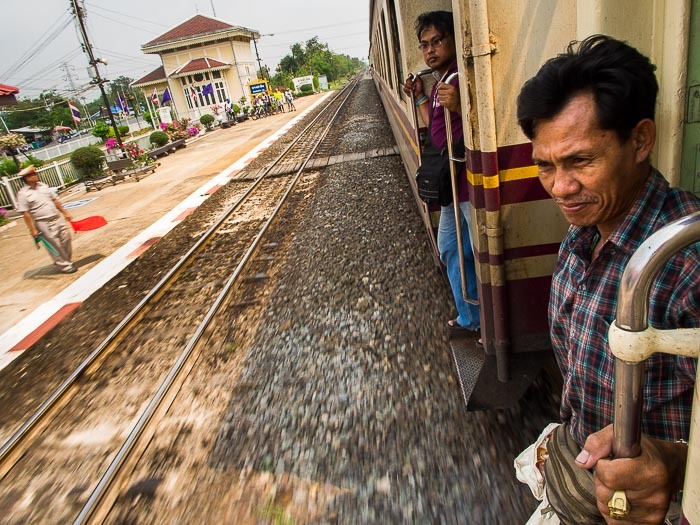 Chinese, Japanese and Europeans are all vying to invest in Thailand's rail system. The Chinese, in particular, want to see high speed rail built from Nong Khai (on the Lao border) to Sattahip, Thailand's main deepwater port. Not coincidentally, the Chinese are also trying to build high speed rail through Laos, from China to Nong Khai, and Laos is a country with virtually no rail currently. That would give the Chinese access to deepwater ports for their factories in southern China. Passengers get ready to hop off a train on the northern line. I've ridden Thai trains from Bangkok to Samut Songkhram, Kanchanaburi, Nong Khai, Ayutthaya and Kabin Buri. It's a great way to see the countryside. The third class trains are not air conditioned and seats are frequently hard benches but they're pretty clean. Not clean room clean but certainly clean enough for people in jeans or travelers clothes. Vendors walk through the trains hawking food (stir fries, like chicken or pork with chilies and basil are popular) and the food, while it won't win any culinary awards, is not bad. Thais are hospitable, so it's easy to strike up a conversation if you want to. 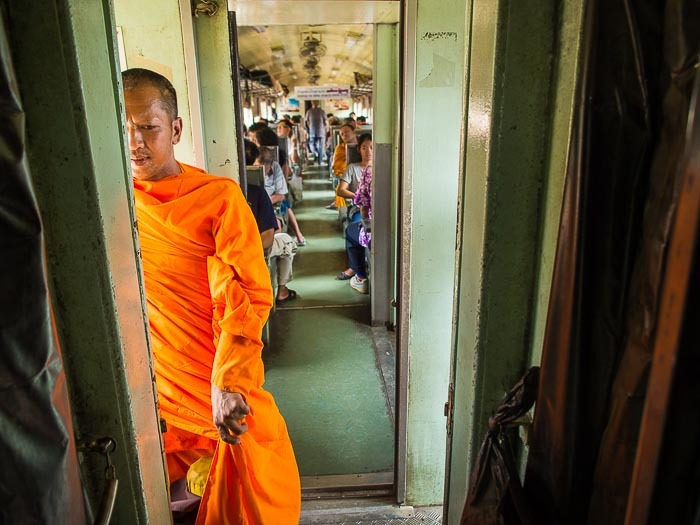 A monk on a train into Bangkok on the northern line. There are more photos of Thai trains in my archive.